Are you uncomfortable standing for long periods of time? Are you experiencing throbbing and swelling in your legs or feet? You may have varicose veins or another vein condition. Vascular surgeon Stephen M. Barnett, MD, has extensive experience using vein ultrasonography to diagnose and treat your specific vein issues. During your first appointment at Vein Therapy of Atlanta, Dr. Barnett conducts a physical exam, reviews your medical history, and, when necessary, uses vein ultrasonography to diagnose your vein condition and pinpoint the specific veins that need treatment. 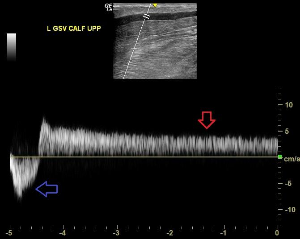 Following the physical examination, an ultrasound examination of the leg veins may be indicated to provide additional specific information regarding the anatomy and functional status of the veins. 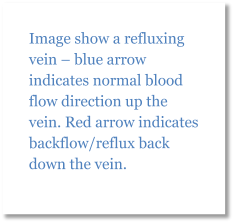 This examination (duplex Doppler scan) uses ultrasound imaging which provides information regarding the location and size of the veins, as well as the direction of blood flow. Vein ultrasonography, also called venous ultrasound, involves a handheld device that uses sound waves to produce images of your veins and measure the flow of blood through your blood vessels. Dr. Barnett also uses vein ultrasonography to locate damaged veins during vein treatment procedures. Ultrasonography is a safe and effective technique for diagnosing a variety of vein issues. 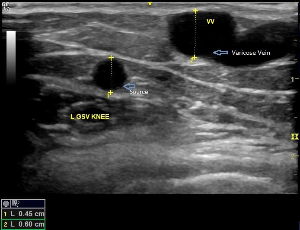 What can vein ultrasonography diagnose? Normally, blood flows 'up' the veins from the feet toward the heart. The calf muscles serve as a pumping mechanism to promote this flow. However, properly functioning valves within the veins allows the blood flow to continue in an upward direction. When these valves no longer function properly, the direction of flow within the veins can reverse, leading to excess pressure within the veins. This, in turn, provokes enlargement of the veins, and over time induce development of secondary veins oftentimes visible on the leg, referred to as varicose veins. Vein ultrasonography helps detect vein conditions early when treatment is most effective. What should I expect during vein ultrasonography? This study generally requires 45-60 minutes. It is pain-free. It is best performed by an experienced technologist who will thoroughly evaluate the deep and superficial veins and provide imaging for interpretation. There is no special preparation required for this examination. What should I expect after vein ultrasonography? Dr. Barnett will review the images and will discuss the findings with you. The findings of this examination, coupled with the history and physical evaluation, will be used to determine whether vein therapy is indicated and which approach to this therapy is most appropriate - one size does not fit all! For more information on vein ultrasonography or diagnostic services, call Vein Therapy of Atlanta.